Fifth-seeded Auburn tried its best to let 12-seed New Mexico State pull off the first big upset of this year’s NCAA tournament by consistently bungling things at the precise moment when they could’ve put the game to bed. Unfortunately, New Mexico State was even more inept when it mattered most, and failed to finish the job. Auburn thoroughly dominated New Mexico State for most of the second half, eventually leading by as much as 13 points. But after going 17 minutes straight without a turnover, the Tigers decided to give the Aggies a shot at orchestrating the comeback by turning the ball over six times in six minutes. The game eventually devolved into a foul-for-three trade-off fest. With eight seconds left in the game, JoJo Zamora hit a late three to cut the Tigers’ lead down to just one point. The Aggies called timeout so that coach Chris Jans could draw up the “foul the guy with the ball” play. It ended up working to perfection. Auburn’s Samir Doughty, an 84.6 percent free throw shooter, missed the first of his two free throws which pushed his team’s lead to just two. This is where things just started to unravel. New Mexico State guard A.J. Harris then took the ball down the floor and found himself an open lane to the basket. In literally any other competitive scenario, Harris would have taken the lay-up and tied things up. Instead, he played the numbers game, decided two was less than three, and ignored the easy opportunity to tie the game so that he could kick the ball out for a potential game-winning three. 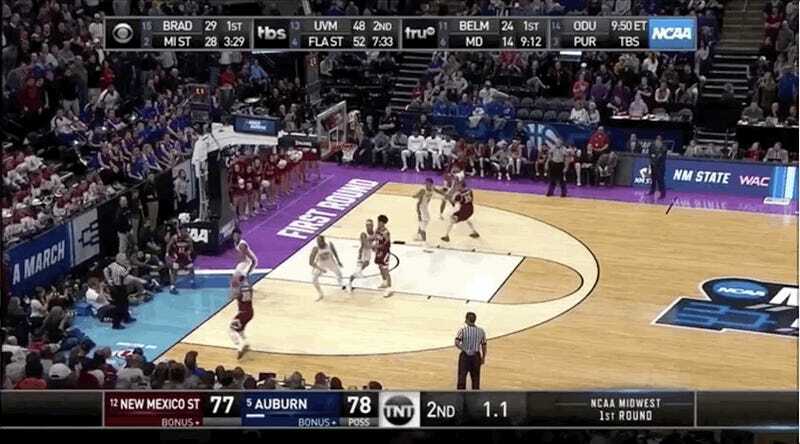 Thankfully for the Aggies, Auburn tried to one-up Harris’s boneheadedness and fouled forward Terrell Brown during the resulting three-point attempt. With under two seconds to go, only three free throws stood between New Mexico State and almost certain victory. With an unimaginable weight of pressure on his shoulders, Brown stepped up to the line. He missed his first shot. No matter, right? He only had to nail his next two attempts to force overtime, and he was halfway there after he sank his second shot. Only his third attempt rimmed out, which probably should’ve killed the Aggies’ chances. But wait! The fat lady had not sung just yet. When trying to corral the rebound from Brown’s missed attempt, a Tigers player knocked the ball out of bounds. This gave New Mexico State possession of the ball yet again from underneath the hoop with 1.1 seconds remaining. Get the ball in and hit one bucket—any bucket—and New Mexico State would live to play another day. But it was at that point that whichever vengeful god was watching over this matchup decided that this is where New Mexico State’s luck would stop. The Aggies drew up a creative inbounds play that gave Trevelin Queen a wide-open look from three, but the guard blew it by missing the game-winner by about four feet. This game just came down to Auburn not being able to keep up with New Mexico State’s incompetence when it mattered most. Hopefully for the Tigers, that’s the only clutch gene they’re truly missing. Fletcher Magee&apos;s Shooting Remade Wofford. How Far Can It Take Them? How Big A Threat Is Saint Mary&apos;s?